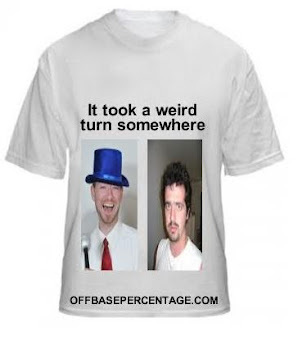 In order to review the 2013 season, the crackpot staff of Off Base is handing out awards to each Major League team. Please send us $19.95 for the shipping and handling of your team's Hello Kitty stickers awards. Here are the Most Valuable Player, Least Valuable Player, Cy Young, Cy Yuck, Rookie of the Year and Reliever of the Year for the Twins. No, only kidding, it was Joe Mauer. The Twins' catcher had another outstanding season - .324 average, .404 on-base in 113 games - and was the only bright spot on an offense that scored just 614 runs. Well, unless you count Brian Dozier and his 18 home runs as a bright spot, but please don't. "The Twins struck out nearly three times as much as they walked (1,430 K, second-most in baseball & 533 walks), but take away Eric Fryer's 3 K, 3 BB season and it's only 1427 to 530." 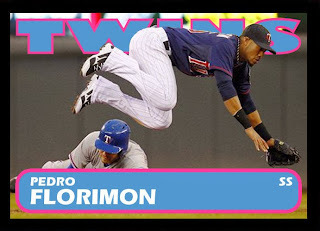 After being claimed off waivers from the Orioles, Florimon hit .219 in 43 games for the '12 Twins. Management had seen enough and made Florimon the everyday shortstop for 2013, and he did dissapoint, hitting .221 with a .281 on-base percentage, though his 115 strike outs were only fourth-worst on the team. Perkins was excellent in the closer's role - 0.92 WHIP, 2.30 ERA, 36 saves - and struck out over 11 batters per nine innings (seventh among AL relievers). Diamond was a pretty good starter for the Twins in 2012, so I'm assuming another solid season was expected of him in 2013. Instead, the southpaw faced 576 batters and didn't get many of them out, or least didn't get Lorenzo Cain out that much on August 1 (two walks and a single for anyone retroactively charting fantasy statistics). Diamond won six games, but four of them came against the Whitesox (3) and Mariners (1), so Diamond won two games. Here's the thing about the 2013 Twins: about six players were valuable. That's out of 319 who wore the uniform during the six-month season. So there seems to be more awards than people. Perkins was the top pitcher and reliever, which makes the left-handed reliever Thielbar the top rookie after being called up in late-May and pitching to a 1.76 ERA in 49 games. Pinto played in just 21 September games, but we can't give the ROY to Chuck Knoblauch because he was a rookie in 1991, and we can't give the ROY to Ernie Fontana because he is an imaginary player, so it's Pinto (.342/.398/.566 in 83 plate appearances).